I am extremely well versed in the “The classic 39“, which were the complete one half-hour episodes that Gleason brilliantly had the piece of mind to shoot on film, which still air on television to this day. They had a great Christmas episode within the 39, which is a gem in its own right. But another Christmas episode has come to light. In the 1980’s, Gleason came out with a slew of long thought to be forgotten episodes he had been sitting on up to that point. These now called “lost episodes” have found their way onto the television rotation within the 39, and can be spotted by the poor video quality because of the media they were originally shot on (so again, thanks Mr. G for pushing for shooting the classic 39 on celluloid!). These episodes originally came from the Gleason variety shows (before they got their own show which became the 39) and can be as short as 8 minutes or as long as 40 minutes, which sadly sometimes are edited down to fit a half-hour time slot with commercials. Evidently, these episodes found their way onto video and DVD, before they too went out of print. This year, a long-awaited box set was finally released, which has the complete ‘lost episodes’ in their entirety and restored to their originally glory. A definite must-have for fans! Within these is a number of once lost holiday episodes, and last night I threw on one of the discs to watch an episode entitled the “Christmas Party” from December 19, 1953. Merry Christmas! Boy was it great. 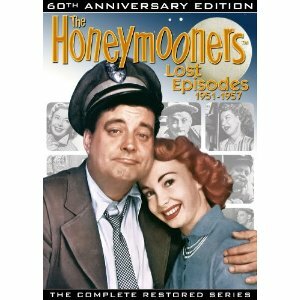 It had everyone we know and love from the show: Audrey Meadows as Alice, Art Carney as neighbor Ed Norton, and Joyce Randolph as his wife Trixie. First off for you Honeymooner fans, the Kramden’s apartment was much different, with a piano and television on the premises. Different furniture isn’t that unheard of, especially since this is an early episode -well before the 39 were shot- while they were still only one of the many skits on Gleason’s variety show. 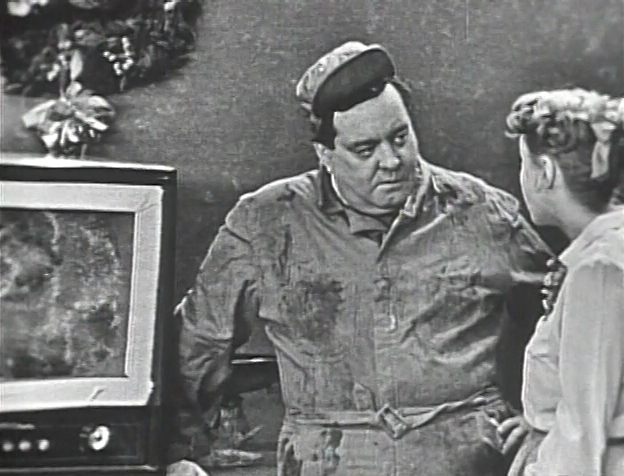 The major difference from any other Honeymooners‘ episode was the plot. 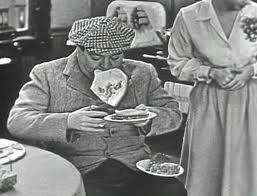 Alice is holding a Christmas party and has sent Ralph out to get potato salad from Krausers (delicatessen as they called it back then). Back with the wrong salad, Ralph is sent back out to get the proper potato salad from Krausers. This takes Gleason as Kramden out of the equation for the episode to unfold. 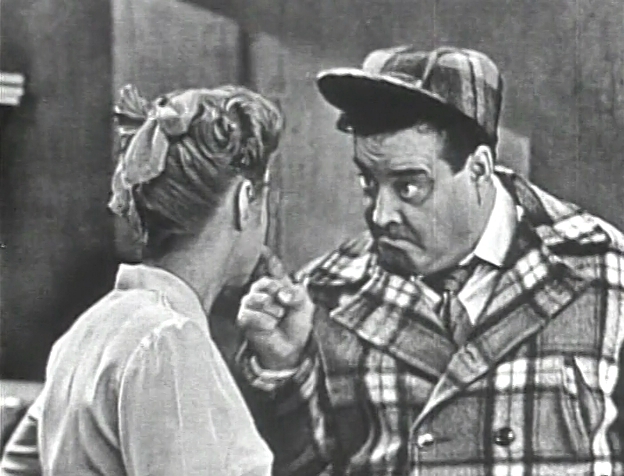 Trixie and Ed come down to chat with Alice and then the some of the most unusual things ever in Honeymooners’ lore takes place. Gleason’s other widely popular character Joe the bartender, again played by Gleason comes up from his bar to explain he is hosting a wild party thrown by none other than the super-rich aristocrat Reginald Van Gleason the 3rd. Joe then coaxes Langford down to his bar to sing a couple of songs, and they both exit. Norton then brings on a young neighbor who is on his way down to sing in the bar, who turns out to a very young Eddie Hodges, and he performs the Nat King Cole arrangement of “Walking My Baby Back Home“. Hodges can be no older than 5, and belts out the song like he has done it a hundred times already in front of an audience of millions. He leaves, and the Gleason’s Poor Soul comes back for a very touching Christmas moment that will make anyone tear up, and he then exits. The loudmouth Rudy the Repairmen (yet again played by Gleason) and his little assistant then come over to attempt to repair the broken television; and hilarity ensures. Lastly, Gleason enters as Reginald Van Gleason the 3rd, complete with a traveling band and lady cabaret dancers and sings and dances out a tune before leaving. 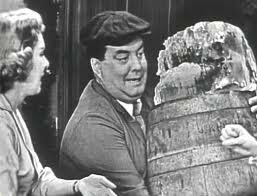 The surprising and hilarious show wraps up with poor Ralph Kramden coming home, escorted by a cop, who thought he was trying to break into Krausers to get the potato salad Alice wanted. 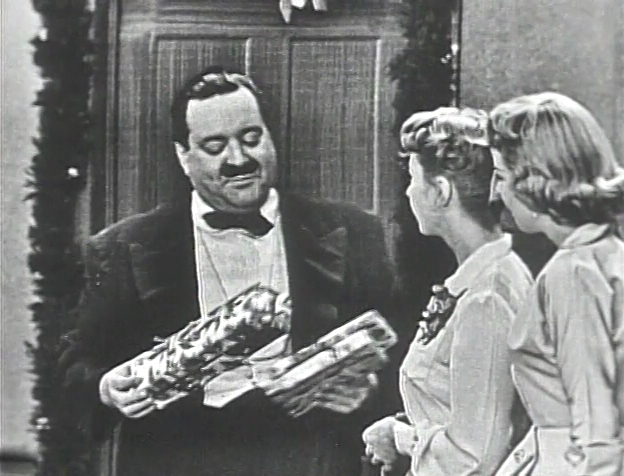 This Christmas episode stands out because for the first and only time in the Gleason universe, all his other famous and popular characters from other skits show up and cameo in the small apartment on 328 Chauncey St. It’s a real treat and a lovely aside in the series to see various characters interact with each other and to know, say, that Joe the Bartender’s bar is on the first floor of the Kramden’s building, or the Poor Soul being treated lovingly by the Nortons and the Kramdens. It is also a testament to the genius that is Gleason, who had to have at least a dozen costume changes in the 35 minute span of the skit, in which Gleason ducks in and out of his wildly different personas. 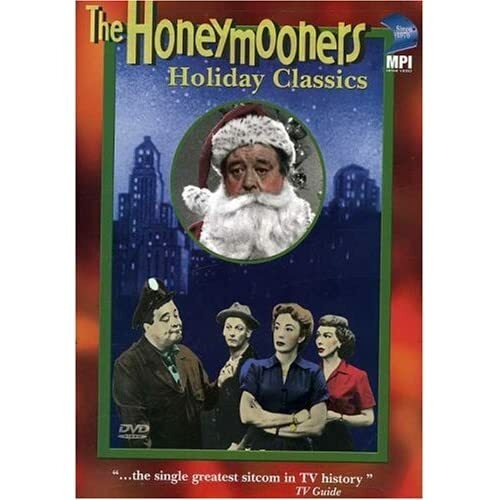 If you are in any way a Gleason or a Honeymooners fan, I wholeheartedly encourage you to seek out this lovely Christmas Special and view a rarity in sitcom history, and certainly the only time Gleason’s cavalcade of characters all guested on the same episode. I guess the only criticism I’d have for the special is that I wished the two guest stars actually sang Christmas Songs, and not regular ballads. If you do not want to spend the coin on the box set, here is a lovely best-of dvd that has the said special. It is a great installment for the holidays, and brings you back to when television was live and amazing. This special and the box set set for that matter is definitely a ‘must-have’ and it also reminds you why Gleason was the original “Great One“.